Edward A. Hinck, PhD, is professor of communication at Central Michigan University. He teaches undergraduate courses in advocacy and leadership as well as graduate courses in rhetorical criticism and communication theory. Edward A. Hinck. 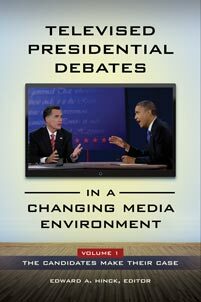 Televised Presidential Debates in a Changing Media Environment [2 volumes]. Praeger, 2018. ABC-CLIO, publisher.abc-clio.com/9781440850448. This two-volume set examines recent presidential and vice presidential debates, addresses how citizens make sense of these events in new media, and considers whether the evolution of these forms of consumption is healthy for future presidential campaigns—and for democracy.